The two photographs in this record were originally one long photograph. The photograph has been divided into two pages, "left" and "right". Notice the over-lapping in the centre of each. Pages 3 and 4 of this record correlate the numbers on each person to their name. Bronte School, S.S.13, later became Centriller Public School. #19, Edith Speers was absent when the photograph was taken; she was ill with diptheria. The photographer returned to later photograph the Baptist-Methodist picnic and photographed Edith. He attached her image to the class photo in his lab. Ross Wark notes that #2, Eliza Adams father owned a good deal of land in Bronte. He was a founding member of the African Methodist Episcopal (AME) Church. 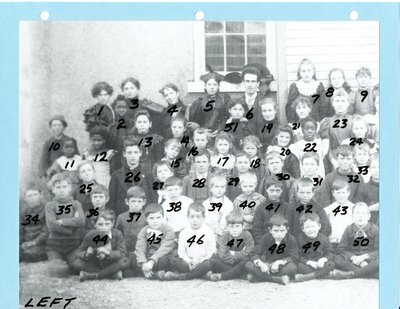 The three ladies on the right, #7,8 and 9 were not part of the school but allowed to participate in the photograph. Lorne Joyce notes that having your photo taken at this time was a rare experience. This photograph is courtesy of Lorne Joyce. Lorne had detailed knowledge of early local community life and local marine history. Each person has a number handwritten on their body. Pages 3 and 4 of this record list and identify most people. "LEFT" identifies the left side of the original photograph, "RIGHT" identifies the right side.